On the threshold of the third millennium, the world today is facing both the quantitative and qualitative changes – quantitative in terms of economic growth and technological innovations and qualitative in terms of a new paradigm of a new society governed by altogether different values and ethos. The world today is facing an agonizing array of choices and challenges. But it has yet to learn how to draw a distinction between ‘good life’ and ‘goodness of life’, ‘needs’ and ‘desires’, ‘immediacy’ and ‘importance’, ‘holistic well-being’ and ‘wanton waste’. It requires a new vision and fundamental rethinking on the very presence of a human being – not as a ‘predator’, ‘polluter’ and ‘consumer’ but as a ‘protector’, ‘producer’ and ‘caretaker’. Nobody can deny that in today’s world, our psychological and physiological well-being is constantly under threat. This threat can come not only from militarism and terrorism, but also from environmental pollution, growing violence, religious fundamentalism and rising consumerism. There are problems faced by the society as a whole – problems arising out of energy crisis, changing demography, rising corruption, mafia operations and restlessness. Nor can we ignore the negative aspects of economic growth and globalization which have led to vulnerabilities, disparities, unhappiness, inequities, alienation, despair and stress. In fact, anxiety over any problem – personal, local or national, only leads to unhappiness. Not only the poor and marginalized sections of society, but the rich and affluent are also afflicted by growing human distress owing to weakening of social fabric, growing violence, maddening competition and lack of true knowledge and guidance. It requires serious efforts towards imbibing those traditional and moral values which go beyond the state and the market and provide a path for the humane and holistic development of all human beings across the world. It is time to realize that the pursuit of inner growth and true happiness is more important than the pursuit of external goods and comforts. In my view, the three cardinal principles of Jain philosophy – (1) ahimsa (non-violence), (2) anekantvaad (relative pluralism) and (3) aparigreh (non-possessiveness) can assure lasting happiness to the humankind. It is based on the ‘cultural symbiosis’ rather than the dominance of any one region, country or religion. These principles lay stress on ‘reconciliation rather than refutation’, ‘cooperation rather than confrontation’, ‘co-existence rather than mutual annihilation’. They aim at promoting the ‘being mode of living’ in lieu of ‘having mode of living’. Whereas the having model may ensure unlimited progress, dominance of human beings over nature, material abundance and unimpeded personal freedom, they are bound to lead to egoism, selfishness and greed as the guiding principles , whereas the being model can lead to sharing, knowing and responding to one another. The principles of ahimsa, anekant and aparigreh are based on the age-old dictum of Jain philosophy: live and let live. These are based on the premise that we have no more right to consume happiness without producing it than to consume wealth without producing it. Instead of pursuing the path of abundance, we need to learn how to put a curb on our mounting desires because our planet earth can only fulfill our needs but certainly not unlimited greed. These principles lay emphasis on ‘non-grasping’. If we try to grasp things or other human beings, it not only affects others but also us, by robbing our freedom and dignity in the process. It can be seen as the root cause of growing discontent and violence. If everybody tries to grasp more than ones needs and deprives the other of the same, it is bound to result into social disorder and collective ill-being. Unless and until we adopt the principle of aparigreh (non-possession and non-grasping) in theory and practice, we will be forced to live in a world that is injured by everyday tragedies of Bosnias and Somalias, on the one hand, and abject poverty, hunger and disease, on the other. Under the present circumstances, the stress on the Jain principle of ahimsa (non-violence) needs to be reinforced. It renounces violence and injuries of all kinds – physical, mental or emotional. Under this philosophy, the individual is required to abstain not only from violence in deed but also in thought. According to the Jain philosophy, there is no quality of soul which is more subtle than ahimsa, and no virtue of spirit greater than reverence for life. This philosophy is very much in tune with environmental protection. It forbids not only the destruction of plants and trees but also the reckless use of minerals and metals. 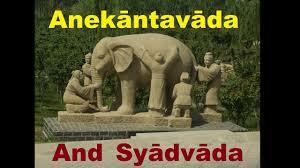 The biggest contribution of Jainism, to my mind, is the concept of anekantvaad and syadavaad. These can be translated as ‘relative pluralism’ and ‘many-sidedness of the truth’. These principles lay emphasis on the fact that our perceptions can only be partially true and/or conditionally true. Therefore, it suggests that it is always desirable to add the qualifying words, such as, ‘perhaps’ or ‘may be’. It encourages an attitude of respect for others’ view points. It believes in the basic principle that there can be many ways of looking at a thing. All of them can be valid at the same time. Seen from some position, something may be judged as true, it may appear false if judged from another position. Seen from yet another position, it may appear neither true nor false or in some measures true and in another measure false or the same thing may be simply ‘true and indescribable’ or ‘false but indescribable’. It is very true for the globalized and interconnected world today. Anekant philosophy holds the opening of one’s heart and one’s mind to the complete picture of truth. It is the first condition of human well-being and happiness. It provides the binding force to the other two principles of aparigreh and ahimsa. Unless and until, we have due respect for others’ view point, we cannot practice either aparigreh or ahimsa. It also helps in coordinating the well-being and happiness of an individual with that of the society. It rejects all forms of absolutism. It rejects both ‘possessive individualism’ and ‘state socialism’. It aims at restoring the natural unity between the individuals and the society, on the one hand, and the planet earth and cosmos, on the other. The concept of happiness propounded by the triple action formula is not only materialistic but also holistic. But the crucial question remains: how to make the cardinal principles of Jain philosophy the guiding principles of millions of men and women in pursuit of happiness all over the world. Dr (Mrs) Asha Gupta is the ex-Director at the Directorate of Hindi Medium Implementation and previously Principal at Bharati College, University of Delhi, India. She is also the Convener of International Political Science Association’s Research Committee on Welfare State and Welfare Societies. Earlier, she was the Convener of IPSA RC on Military’s Role in Democratisation. A recipient of Indo-Shastri Canadian Fellowship twice, Fredrich Ebert Stiftung Fellowship twice, Norwegian Fellowship for a project on Welfare state, UGC Career Award in Humanities for a postdoctoral project on the Welfare State and the Issue of Privatization. She was selected for the Major Research Project by the UGC on Vocationalization and Privatization of Higher Education in India. Dr Gupta has published 12 books, edited 1 book and co-edited 1 book. Her books include Socialism in Theory and Practice, Changing Perspectives of the Welfare State, Beyond Privatization: A Global Perspective, Higher Education in the 21st Century: Looking Beyond University, Changing Perspectives of Higher Education (in Hindi), Comparative Government and Politics (in Hindi) etc. She has participated at various national and international conferences and published about 70 research papers. I'm a Statistician, and There's Literally No Such Thing As "Finding Time"